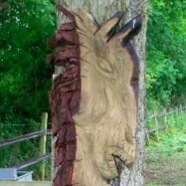 Description: Wood carved at HorseWorld in fifteen minutes with a chain saw. 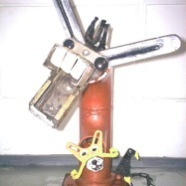 Description: Chair Legs, bed springs, washing machine drum, assorted metal scrap wiring & plastic sleeves. 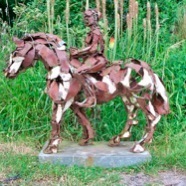 Description: Welded reclaimed steel, previously displayed at RHS Wisley Garden. Description: Bits of china and broken glass. Named after the constellation shaped like a unicorn. 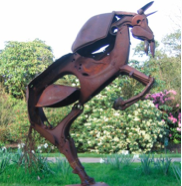 In myth the unicorn was the first animal named by Adam in the Garden of Eden. 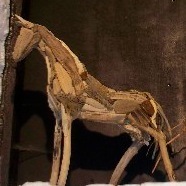 Title: Driftwood Horses (Located in HorseWorld Museum). 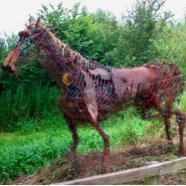 Description: Sculptural horses utilising the beauty and natural form of driftwood collected from beaches on the South Coast of Cornwall. No piece of the driftwood is cut or shaped in any way and is exactly as found. Description: Welded steel. Vespa scooter frame, horseshoe, petrol tank, wheel barrow. 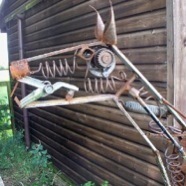 Gilbert has exhibited sculpture at the Royal Academy. 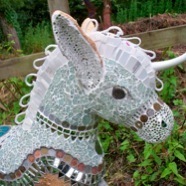 Description: Inspired by "Donkey" the loveable character from the movie ‘Shrek’. Drainage pipes and other welded industrial waste metals. Description: Security grill legs, metal chains, power transmission shaft, old engine parts, cogs, spanners and springs. 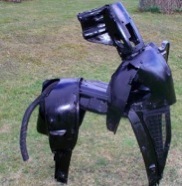 Description: Black centaurs: Plastic parts from car innards. 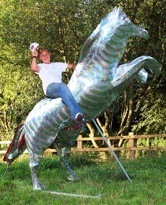 Silver Centaur: Lining from a scrapped Land Rover. Description: A willow frame pressed with a manure, clay and lime mixture. Sophie collected the dung from HorseWorld. 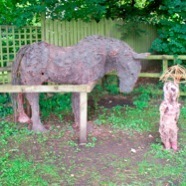 Horse and cow dung mixed with clay was used in the past, in house building. “The fibre in the manure and also animal hair, straw and hay all add to the strength of the mix”. Description: A collection of reused household items, old baskets, baking tins, combs, saucepan lids and bits of broken furniture. Description: After the painting by Douanier Rousseau. Flue piping, colanders, metal blinds. Description: Reclaimed CD’s over a welded metal frame. 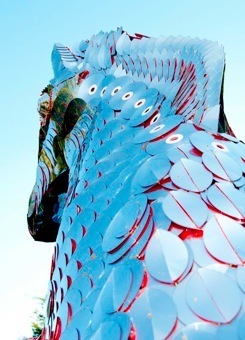 Over 5,000 reclaimed CD’s were used in the making of this magnificent 10’6” horse. 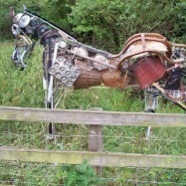 Dean spent many weeks in a horse field (working in all weathers) to finish it! NB: Sale proceeds will be donated to HorseWorld. 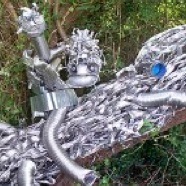 Thanks to: The Recycling People (CD’s), Stuart Cank (Welding), Phill Cank (Photography) and DGT Transport (of Leicester). 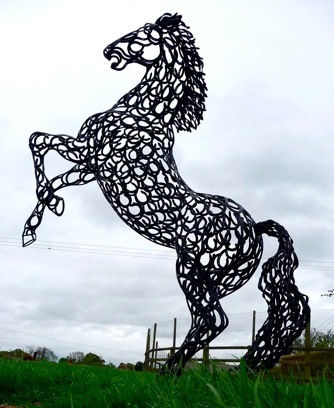 Description: This breathtakingly realistic 11ft Stallion was made entirely from 600 re-used old horseshoes, and took 2 months to make. 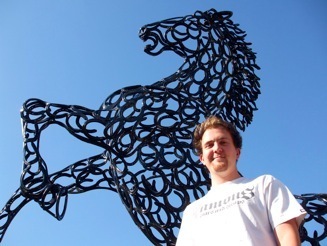 Tom grew up in Herfordshire surrounded by horses! Don’t miss this beautiful masterpiece on display ‘til 2nd October!